Although doubts have been expressed regarding the attribution of this work to Leonardo due to the rigid pose, it is now generally accepted that Leonardo executed the face and neck in light of the skilful modelling and the expressive quality of eyes. 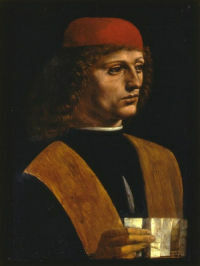 Antonio Boltraffio, who was a pupil and assistant of Leonardo’s in Milan, is credited with the entire upper body. Some areas of the painting have been left unfinished, including the red cap and parts of the clothing, while other parts have been retouched at some later point in time. The work has been executed on a walnut panel, a wood not commonly used by Lombard artists but used by Leonardo for other works such as the Portrait of Cecilia Gallerani, and recommended by him to painters in his treatise on painting. While the identity of the sitter remains uncertain, several individuals have been proposed, including Franchino Gafurio, who was a friend of Leonardo’s, an outstanding musician, composer and conductor of the Cathedral choir in Milan from 1484 until his death in 1522. The inscription on the sheet of music, “CANT(OR) ANG(ELICVM) may be a reference to Gaffurio’s Angelicum ac divinum opus. Alternative identifications include the lutenist Francesco da Milano and Atalante Migliorotti, who was a pupil of Leonardo’s, who learned to play the “lira da braccio” from him, and who went with him to Milan from Florence in 1482.